I don’t know if Sentier is the author’s real last name; if yes, what a coincidence! Sentier means “trail” in French and from that we are not very far from the “ways” of the title. The double meaning is well played in the book itself as is it as much about the Elen of the Deer Tribe as about the life of Elen, the author. She is presenting herself as Awenydd or a British native shaman, spirit keeper, and taleweaver. She learned from a very young age from her mother, father, and extended family. Most of the book is a first person narration that allows the reader to glimpse a life informed by Elen’s ways. It is not simply the account of someone who observed, but a personal story rich with emotions. I understand that she lived in a small village in Wales around 1950, but some of her experiences I found difficult to believe and I see them more as a romantic vision. For example, children were allowed to assist the village Midwife in birthing, but also in washing the body of the decease. Starting from archeological evidence we learn that reindeer and caribou were important to people living in the north. They provided them with food, shelter, and clothing, but also were the subject of artistic expression and reverence. The hunter-gatherers had a good life following the herds and were not malnourished nor sick. They had no sense of land ownership and by keeping the connection with nature, following the migration of animal, balance was kept with the world around them and also among them as their society was not as divided between man and woman that we were lead to believe. They also had a lot more of leisure time that we have now. In the book we are shown photographs of carvings and paintings that are beautiful and prove they had time to devote to art and spirituality. 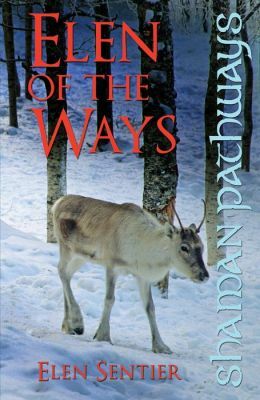 The way of life of the reindeer tribe is also explained, how they were organized, when they migrated and where, and then the author made some connections between the animal’s way and story of Sovereignty. How it is the Goddess who holds the power while the gods are the guardian of it. The hero who wishes to marry the Princess first struggles and passes a test before he is deemed worthy. In the herd the young males fight to prove their worth before they can mate. Elen of the Ways is the guardian goddess of the silver treads or energy lines and magical pathways that connect the sacred wells and sacred places of Britain. The author gives an account of a pilgrimage in Scotland, visiting sacred places there. She does tell some of it in a way that make you live it. That way teaches the reader how to approach sacred landscapes and ways of communicating with the spirit of places. All this: learning the way of animal, feeling the connection with the treads, seeing the sovereignty, are building blocks allowing one to start being Awenydd. The last twenty pages or so are practical ways to implement what you have learned about Elen of the Ways. It is a small book, under one hundred pages, but it is worth the time to read it. I learned about the ancient way of life of the hunter gatherer and how keeping the connection between humans and nature might have helped the tribes survive. I also learned about the place of shaman, Awenydd, in the more modern setting of the 21st century, and finally how this function might still be relevant today. It gave me a historical, mythological, and geographical understanding of Elen the Grandmother Deer and, should you choose to do so, how to hold the treads together to weave a better future. I have just read this booklet and it has opened connections in my head like wild fire! It confirms my own initiatory experience. I’m eager to read more.